The "shear heating" mechanism suggests that tidal forces acting on fault lines in the moon's icy shell cause the sides of the faults to rub back and forth against each other, producing enough heat to transform some of the ice into plumes of water vapor and ice crystals. 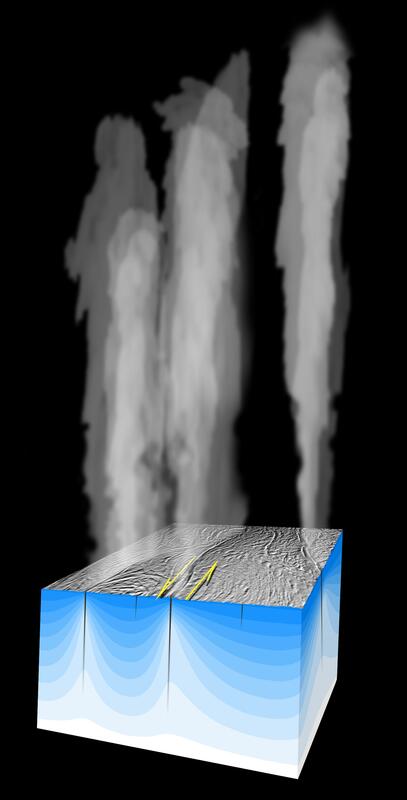 Cold sub-surface ice (blue) becomes much warmer near the active fractures from which the plumes emanate. Movement along the fault lines may be about half a meter (20 inches) over the course of the 1.37-day tidal period of Enceladus around Saturn. For more information about the Cassini-Huygens mission visit http://saturn.jpl.nasa.gov/home/index.cfm .